Tangerine by Christine Mangan is a sharp dagger of a book—a debut so tightly wound, so replete with exotic imagery and charm, so full of precise details and extraordinary craftsmanship, it will leave you absolutely breathless (available March 27, 2018). 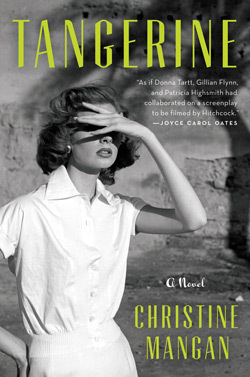 The manuscript that eventually became Tangerine was plucked from a slush pile by literary agent Elisabeth Weed, whom Christine Mangan thanks in her acknowledgments. This will no doubt give un-agented and unpublished writers a spark of hope. Mangan doesn’t go into great detail about the hard work she put into this novel or the number of drafts she wrote to get to publication, but I can tell you about the rollercoaster ride I went on while reading her first novel. I was quickly pulled into the story and found myself going up and down with it—enjoying it, not liking it, thinking that it was clever, thinking that it was stupid, thinking that maybe I was stupid and not getting something. Eventually, I started to make connections. After finishing the novel, I started making even more connections—and now I’m in desperate need of a friend to read it so we can discuss. The novel starts at the end, a prologue set in Spain. Three men pull a dead body out of the water. The narrator is thinking—about Tangier, about her—and tells the reader that her mind now “often plays tricks” on her. And then, with Chapter One, we’re in Tangier. It’s 1956, and although the rationing of World War II might be fading away, the shockwaves from the war are reverberating, causing a swelling of discontent. Lucy, Alice’s old college roommate, shows up in Tangier. Alice and Lucy met as freshmen. Alice had lost her parents in a car accident at a young age and struggled emotionally. Lucy also lost her parents at a young age. The girls bonded quickly and fiercely, but eventually, and perhaps inevitably, cracks began to form in their relationship. In their junior year, tragedy struck, and a year later, Alice found herself in Tangier trying to start over. I [Alice] felt myself blush. I had never told John much about Bennington, about the accident—only what any of the newspapers had reported. Instead I had pushed away everything to do with my former life, including Lucy, and the camera that I had once considered my most prized possession and now sat, unused, the shutter-release most likely rusted from disuse. Still, it had been among the few possessions that I had brought along with me to Tangier—a great what if, rattling away somewhere, at the back of my mind. And while I hadn’t yet released it from the depths of my suitcase, in the back of our bedroom’s wardrobe, I sometimes thought I could feel its presence as I walked past, so that more than once I had hurried my footsteps in response. Game on. A competition erupts between the characters. There’s also a shady character named Joseph and a prostitute name Sabine. Alice is torn between Lucy, John, and her memories. The tension builds and builds. Where the writing gets a little thin, the story is carried along in the reader’s mind by other popular culture representations of Tangier and stories of lonely, vulnerable girls like the unnamed woman in Daphne Du Maurier’s Rebecca or those in Sarah Water’s Fingersmith. Readers will no doubt enjoy the direct references and allusions to classic writers and books. If you’re in the mood for a novel that will keep you guessing, this is for you. There are a lot of layers to sift through, and when it’s over, you’ll want to sift through them all again. Definitely a novel for book groups to consider.